adee is a stylish bar where you can enjoy a variety of drinks including original cocktails and bar snacks under glittering chandeliers, while looking over the view and vivid colours of downtown Osaka. Soak in the sunset vista from the “standing seats” at our soaring 4.8m-high windows. After the sun slips away beyond the Yodogawa River, our variety of musicians and projection mapping on the walls ensure this is the trendiest bar in town. adee is turning up the beat each evening from 9pm, Thursday through Sunday. We are excited to present an electrifying new lineup of entertainers. Go to LIVE ENTERTAINMENT below and learn more about the artists. Experience the exhilarating array of live entertainment at adee - your chic destination to top off each day. You are cordially invited to a spectacular black-tie soirée set against a backdrop of Osaka’s glittering skyline and projection mapping at bar adee. 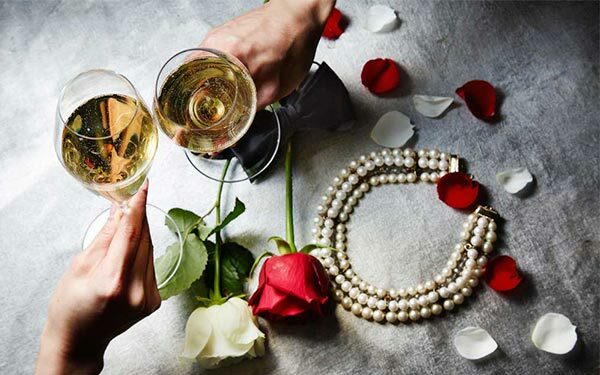 Indulge in free flow drinks including the superb Louis Roederer champagne while enjoying live music at this season’s premier event. While enjoying our fine gin, signature cocktails, world whiskeys, or boutique beers, you will want to taste our array of appetizers, sandwiches, and sweets. From crudites and tempura to mini wagyu burger and caviar, adee offers a wide assortment of mouthwatering delicacies. To complete your experience, try a tantalising treat such as our pralines, chocolate-dipped strawberries, sorbets, ice creams, or seasonal fruits.Champagne and reserve your experience taking in “Osaka Lights”. On Fridays, Saturdays, Sundays, and holidays from 11:30 a.m. - 2:00 p.m., adee is proud to offer guests our One Plate Lunches. These gourmet meals include a main course of fish or meat along with salad, fruit, dessert, and coffee or tea. Enjoy these special meals at a set price while taking in the breathtaking views and stylish ambience of adee. 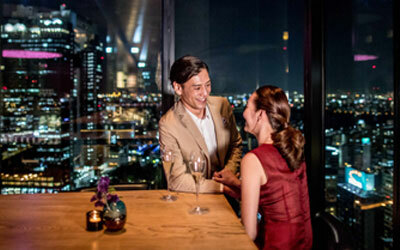 Our renowned Krug Corner is always in high demand for its unparalleled night views of Osaka, sparkling in romantic splendour. “Osaka Lights” is the perfect spot for that special celebration or cherished moment together. Enjoy adee’s seasonal cocktails or fine Krug Champagne and reserve your experience taking in “Osaka Lights”. Thursday through Sunday each week, adee comes alive with superb vocal and instrumental performances to complete your evening’s entertainment. Thrill to the sounds of redB and Stuart Mansfield, as well as the exciting accompaniment and variety of musical styles from visiting guest artists. Smoking permitted from 4:00pm on weekdays and from 5:00pm on Friday, Saturday, Sunday and public holidays. The legal drinking age in Japan is 20 years old. Guests under the age of 18 years are not allowed after 7:00 p.m..